Today, two things: the winner of Guide to Hedebo Embroidery from last week’s give-away, and foreshadowing the next give-away, which is also a beautiful whitework book that’s become pretty rare and mighty pricey! First, the winner of Guide to Hedebo Embroidery by Stefania Bressan and Laura Marzorati. If you remember, I asked the question, What is it that appeals to you most about whitework embroidery? and there were so many answers there that echoed my own thoughts! Elegant, timeless… that’s whitework! I enjoyed reading your answers, especially because I’m preparing some whitework and working with whitework threads quite a bit right now, and I found your answers motivating. Congratulations, Linda! Please drop me a line with your mailing address, and I’ll get your copy off to you soon! If you’re looking for your own copy of Guide to Hedebo Embroidery, you’ll find resources listed at the end of my review. Also, you might keep an eye on the Lacis website. They do have some Hedebo embroidery books, and I think they are looking into carrying this one, too. And it’s downright expensive if you do find it. 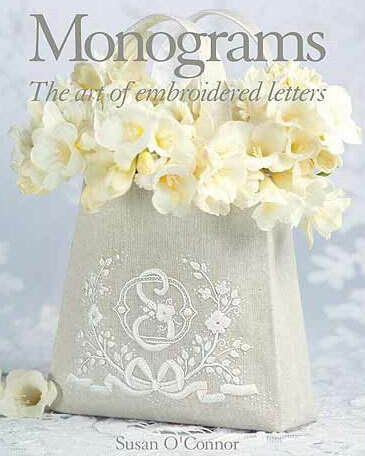 But it’s an excellent book on the art of hand embroidered monograms – and a beautiful book! I had a rare opportunity to purchase a couple copies a while ago, and I’m giving one away in the not-so-distant future. Rumor has it (or had it last year, anyway) that Country Bumpkin was looking into having this title re-printed, but it hasn’t come about yet. So if you’ve pined for this book, if you’ve sought high and low for it, or if you’ve balked at the prices being asked through used book sources (no kidding, I saw one source asking over $700 for it – which is just silly), the upcoming give-away is tailor-made for you. So, keep an eye out for that. And thanks to all who participated in the Hedebo give-away. Looking forward to the next one! Congratulations Linda. 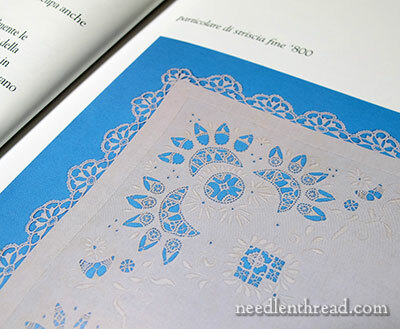 I have dabbled in some needle lace and will say that some of these Italian language books are visually wonderful….if you cannot read Italian. I am sure you will enjoy it. This is the 2nd out-of-print book I have that has gone crazy-priced on the used book sites. Don’t be jealous – those are *far* outnumbered by the OOP books I’d like to get but are priced out of my budget. The other book I have has recently been released as an e-book. I wonder how many others will take this route? Congratulations Linda. Hope you enjoy your gift! So many things you recommend, Mary, are put out of reach by the postage from America, but having Country Bumpkin in the next state to me makes up for that. I have Susan O’Connor’s beautiful monogram book and absolutely love it! Congratulations Linda I hope you really enjoy this lovely book and thanks Mary for the give-away and the monogram book looks lovely I can’t wait for the review. I hope you have a great weekend enjoy Mother’s day on Sunday. And congratulations Linda. Have a total delicate, elegant experience with your prize. Happy Mother’s Day this Sunday to all Aussie Mums. I probably wouldn’t have had it in mind tonight except for some undefined reason the cover of Susan O’Connor’s book reminded me of Mothers. How absolutely sweet of me : ) !! Thanks Mary, I haven’t seen that book but being one of Susans and Country Bumpkins makes it immediately desirable. The photography in it will be so beautiful and the instruction well defined. Looking forward to the review. Congratulations, Linda! I hope you enjoy your book! Hi Mary, Congratulations to Linda B….I’m sure she’ll enjoy her prize ! I’ve never seen this book before and I’ve never embroidered a monogram…..Maybe I should ! Thank you, everyone, for all the congratulations! I’m so excited!!!! I can’t believe it! Thank you so much, Mary, for the beautiful book!! I want to thank you, too, for everything you do to spread and enrich the art of embroidery and for those of us that love it. Over $700? For a book? Wow! You’d want to lock it up in a bank vault at that price. Methinks this one will not be going on my wish list! We have one copy of this book in our guild’s library which we purchased a few years ago when I was the librarian. It was pricey then but a good investment. I really hoe that Country Bumpkin do a reprint. It is a beautiful book with clear photos and instructions and interesting info about monograms. It would be awesome if I had a copy of my own…. !